Hurricane Harvey (still categorized as a Tropical Depression at the time of writing) brought record-level rainfalls to East Texas and West Louisiana, causing flooding and destruction throughout the Gulf Coast. Cumulative rain falls surpassed 50 inches in some area, the most rain ever received from a tropical cyclone system in the Lower 48 states. Because the storm moved so slowly, averaging just 3 mph at some times, it was able to dump large amounts of rain over a relatively focused area. Harvey was unique from other storms in that it struck Houston, the largest refining hub in the U.S. Because of the unique geography of the storm, Harvey had an unprecedented effect on fuel prices nationwide. Overall, Texas has roughly 5.7 million barrels per day (MMbpd) of refining capacity, converting crude oil into the gasoline, diesel, jet fuel, and other products this country runs on. At its peak, Hurricane Harvey had knocked out roughly 5 MMbpd of refining capacity – nearly the entire fuel production capacity of Texas. For context, that 5 MMbpd makes up roughly 25% of the entire refining capacity in the U.S. Imagine if 25% of the Starbucks coffees around the country had been taken off the market – Millennials would have been protesting in the streets! Today, 4.1 MMbpd remain offline in the Gulf. Each day those refineries are offline, 172 million gallons of fuel are not entering the market. From a market impact perspective, at 8,000 gallons per truckload delivery, that’s 21,500 truck deliveries of fuel daily that cannot be supplied to the market in Texas and along the East Coast. With so much capacity offline, fuel prices soared at rates not seen in decades, leaving all but the most experienced traders dumbfounded. 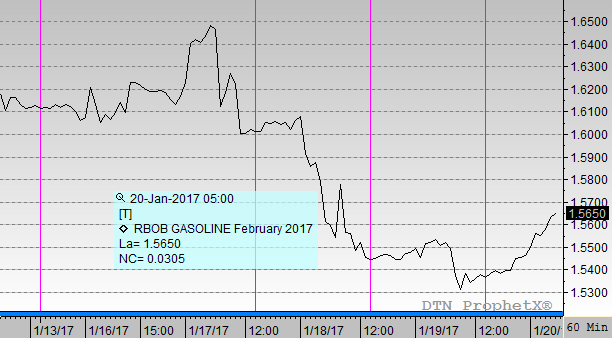 RBOB Gasoline prices soared from $1.58 last week all the way to $2.14 yesterday – a full $.56 gain, or nearly 30%. The last time gasoline gained even close to that much in a two-week period was in March 2011, at the peak of the Arab Spring when crude prices surpassed $100/bbl and prices rose just $.47. Consumers across the country have felt this large price spike at the pumps, with retail prices surging higher seemingly overnight. Looking at the below map of refineries across the U.S., it’s easy to see why the damage was so significant. The majority of U.S. refining capabilities are located in the Gulf. As we noted above, Texas accounts for 5.7 MMbpd of refining production, out of roughly 19 MMbpd around the country. With nearly all of the Gulf refining capacity offline, fuel throughout the country became more scarce. The lines on the map below represent major pipelines across the U.S. Note how many of the pipelines begin in the Gulf Coast and move inland. In particular, the while pipeline running through the Southeast, the Colonial Pipeline, originates the majority of its product from the Gulf, meaning that Southeast consumers were particularly hard hit by the storm. Product flow along the Colonial has become significantly delayed; pipeline shipments that typically came every 4 days are now stretching to eight days or more. Because of the delays, fuel prices in the Southeast have skyrocketed. 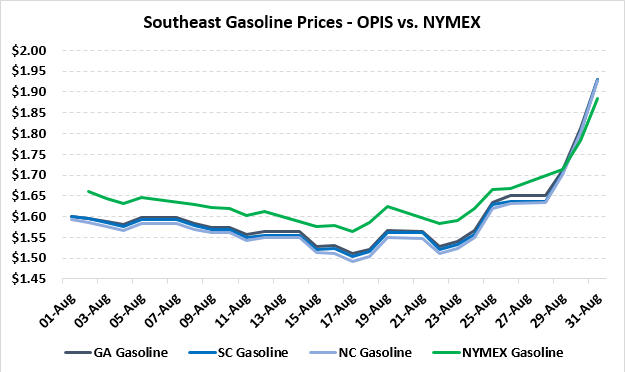 States like Georgia, South Carolina, and North Carolina were trading at discounts to the NYMEX at a wholesale level at the beginning of the month; since the hurricane brought refining offline, gasoline prices in these areas has actually risen above NYMEX levels. That means that during a period when the NYMEX rose $.30 (leaving out Thursday’s $.20 price gain, since NYMEX prices are not reflected in wholesale prices until the following day), consumers in the Southeast have felt over $.40 of price increases, with more price increases likely to come until refining capacity normalizes. In response to the storm, numerous waivers were issued to help ease some of the supply shortages. Boutique fuel requirements in Texas and Atlanta were waived, allowing fuel from other markets to be brought in without penalty. Throughout the Southeast, RFG requirements (typically put in place during the summer) were waived, allowing gasoline from other markets to be used. Additionally, many states have waived hours-of-service regulations, allowing drivers to sit in long lines the fuel racks in order to pick up fuel for delivery. While refined product prices rose precipitously, crude prices actually fell this week. 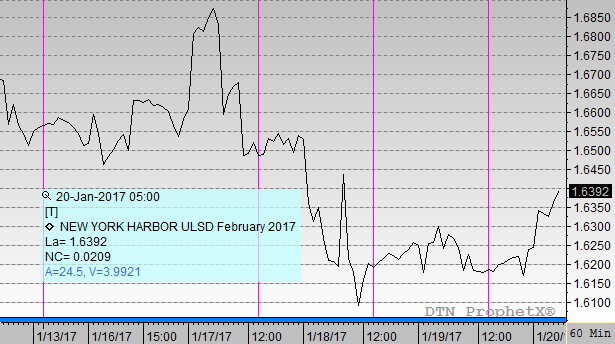 Only about 1 MMbpd of crude oil production was brought offline due to the storm. With refineries consuming 5 MMbpd less crude, there was a surplus of crude oil in the U.S., causing WTI crude prices to fall to below $46/bbl before rising this morning as the September NYMEX expired and markets rolled to October futures. 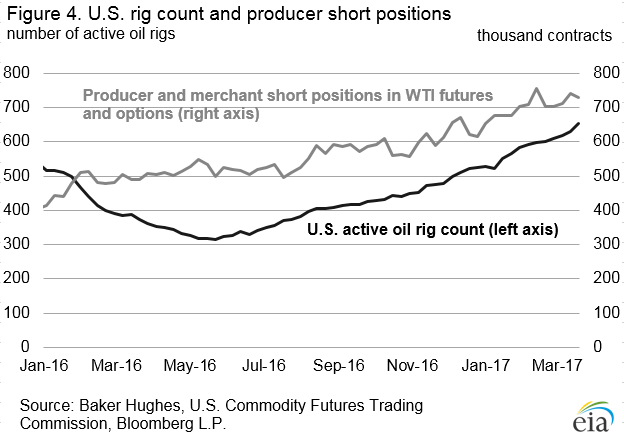 Interesting, as we reported earlier this week, international crude prices remained high, driving the spread between American (WTI) crude and international (Brent) crude to 2-year highs. The real question that arises now is what comes next. Prices have risen significantly, and consumers want to know when they’ll begin making their way back down. Refiners in the Gulf are beginning to restart production. Corpus Christi, home to several large refineries that supply the North Texas area, are going through restart procedures now, which will alleviate some of the local tightness. Refineries in Port Arthur, Beaumont, and Baytown, which supply the Southeast through the Colonial Pipeline, are just beginning to assess damages to determine whether it is safe to restart units. So far, no major damage has been reported, though Motiva’s Port Arthur refinery, the largest in the country, is flooded and will take several weeks to bring back to full efficiency. The Colonial Pipeline has announced that they expect to resume operations in the Houston-Lake Charles segment of the pipeline by Sunday. Hopefully bringing this segment back into operations will help move more product to Lake Charles, which can be shipped up through the Southeast. Mansfield remains on Red Alert for several Texas cities, as well as for markets in the Southeast. Red Alert is Mansfield’s highest level of alert, with teams working around the clock to keep contract customers operational during the supply shortage. If you have any questions or need to secure supply in the Gulf area or in the Southeast along the Colonial Pipeline, please reach out to your sales rep or customer relationship manager for more information about ordering product. To learn more about Mansfield’s disaster response program, please contact us at 1-800-695-6626 to learn how you can better prepare for future disasters.